Teenagers using cannabis are especially prone to schizophrenia. Recognising when 'experimental use' has become 'problem use' will help prevent this adverse outcome. Cannabis use becomes an addiction when it takes on a much higher priority than other behaviours that once had greater value (studies, football). A central characteristic of cannabis dependence syndrome is craving - a strong and overpowering desire to take the drug. Has smoking pot stopped being fun? Do you ever get high alone? Is it hard for you to imagine a life without marijuana? Do you find that your friends are determined by your marijuana use? 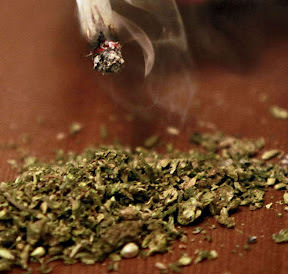 Do you smoke marijuana to avoid dealing with your problems? Do you smoke pot to cope with your feelings? Does your marijuana use let you live in a privately defined world? Have you ever failed to keep promises you made about cutting down or controlling your dope smoking? Has marijuana caused problems with memory, concentration, or motivation? When your stash is nearly empty, do you feel anxious or worried about how to get more? Have friends or relatives ever complained that your pot smoking is damaging your relationship with them?